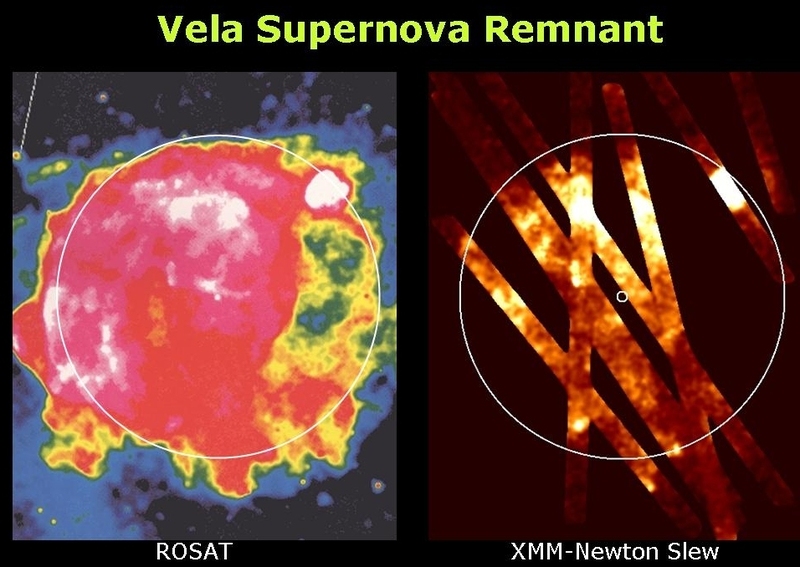 The image on the left is the Vela Supernova Remnant as imaged in X-rays by ROSAT. On the right are some of the slew images obtained by XMM-Newton in its “spare” time. The Ring Nebula. Check. M13. Check. Next up: The Whirlpool galaxy. You punch in the coordinates and your telescope takes off, slewing across the sky. You tap your feet and stare at the stars. These Messier marathons would go much faster if the telescope didn’t take so long to slew. What a waste of time! Don’t tell that to the x-ray astronomers. “We’re putting our slew time to good use,” explains Norbert Schartel, project scientist for the European Space Agency’s XMM-Newton x-ray telescope. The telescope, named for Sir Isaac Newton, was launched into Earth orbit in 1999. It’s now midway through an 11-year mission to study black holes, neutron stars, active galaxies and other violent denizens of the Universe that show up particularly well at x-ray wavelengths. For the past four years, whenever XMM-Newton slewed from one object to another, astronomers kept the telescope’s cameras running, recording whatever might drift through the field of view. The result is a stunning survey of the heavens covering 15% of the entire sky. Sifting through the data, ESA astronomers have found entire clusters of galaxies unknown before anyone started paying attention to “slew time.” Some already-known galaxies have been caught in the act of flaring—a sign, researchers believe, of a central black hole gobbling matter from nearby stars and interstellar clouds. Here in our own galaxy, the 20,000 year old Vela supernova remnant has been expanding. XMM-Newton has slewed across it many times, tracing its changing contours in exquisite detail. The slew technique works because of XMM-Newton’s great sensitivity. It has more collecting area than any other x-ray telescope in the history of astronomy. Sources flit through the field of view in only 10 seconds, but that’s plenty of time in most cases to gather valuable data. The work is just beginning. Astronomers plan to continue the slew survey, eventually mapping as much as 80% of the entire sky. No one knows how many new clusters will be found or how many black holes might be caught gobbling their neighbors. One thing’s for sure: “There will be new discoveries,” says Schartel. Tap, tap, tap. The next time you’re in the backyard with your telescope, and it takes off for the Whirlpool galaxy, don’t just stand there. Try to keep up with the moving eyepiece. Look, you never know what might drift by. See some of the other XMM-Newton images at http://sci.esa.int . For more about XMM-Newton’s Education and Public Outreach program, including downloadable classroom materials, go to here. Kids can learn about black holes and play “Black Hole Rescue” at The Space Place, under “Games.” This article was provided by the Jet Propulsion Laboratory, California Institute of Technology, under a contract with the National Aeronautics and Space Administration.